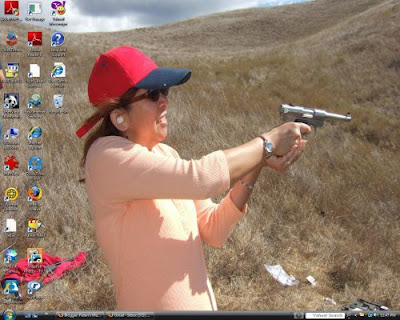 I hadn't chosen a background for my new desktop so when I got tagged by Angie, I quickly chose a picture from my target shooting taken last weekend. :-) Go ahead, Punk! Make my day! I now tag, Nightwing, Mr Green, Cuthess, Borneo Guy, Hooi Imm and Cat Cat. B. Post the picture in your blog. You can also give a short explanation on the look of your desktop just below it if you want. You can explain why you preferred such look or why is it full of Icons, things like that. Please don't shoot me. hehehe.. thanks for doing it. Nice picture. im afraid to make you mad. hehe. thanks for doing the tag. you may want to check out others who did gave a Free View of their desktop.